This house on an exposed hill in the Ayala Greenfield Estates overlooking Laguna de Bay has been a collective creative project. Certainly, the house has a meditative calm about it with its beautifully flowing and interconnecting spaces, its unerringly considered placement of art objects and its graceful relationship with its garden and the panoramic views beyond. The house is an assembly of transparent cubic volumes generating multiple cross-views from room to room and from the inside to the outside with the garden, the views to the lake and to Mount Makiling. These spaces work both vertically and in plan. Initially, the house presents as a modernist structure with its characteristic horizontal planes. But the striking palm-like glass sculpture at the leading corner of the outside terrace (which seems to fit so snugly under the apparently cantilevered second floor but which happens to also disguise a supporting column) introduces a vertical element that is reinforced inside the house by the void above the dining room and the stairwell with its extraordinary mobile sculpture of suspended dark grey paper ‘stones’. As well as works of art, the house contains a collection of classic modern furniture and lighting. It has a white palette and is completely transparent, exemplified by the double-height living pavilion. The white palette and largely glass skin also serve another purpose – to foreground the material qualities of the art works, because the owner’s taste runs to highly textured works of art which are then adroitly positioned to form a conversation with a collection of sleek, contemporary, iconic furnishings. In a sense, the house functions like a museum because its design enables each artwork, object or piece of furniture to be appreciated for itself. Each object is celebrated for what it is, for its intrinsic quality and character rather as a token of a brand. 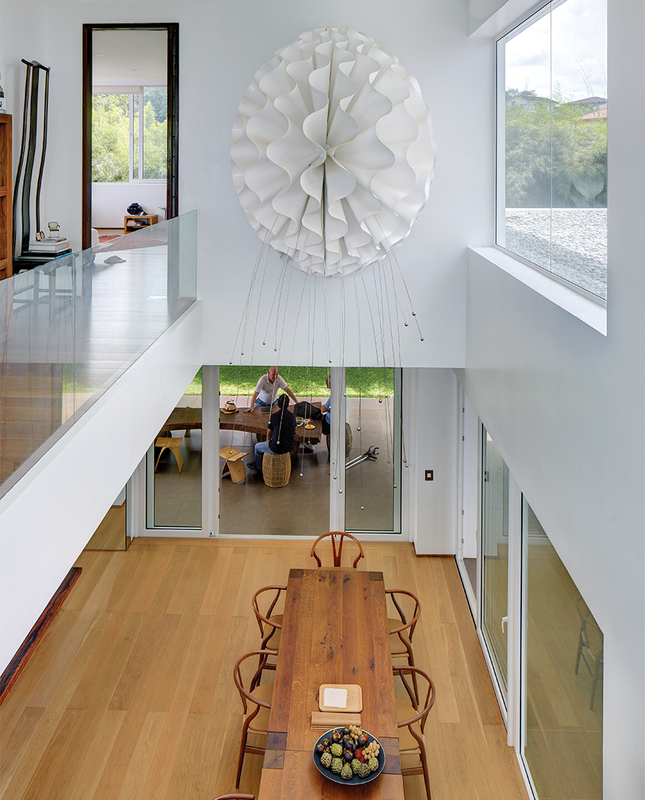 Apart from some specific items, such as the German e15 dining table, all the timber in the house is recycled, just as many of the art works reflect the owner’s preference for natural materials. While the house has a number of environmentally sustainable features, it is most notable for its cultural sustainability, displaying the work of Filipino artists and supporting traditional craft while pulling together a diverse collection of old and new, raw and sophisticated art works, furnishings and lighting to make an argument for cultural continuity and universality. It is a house which highlights the value of materiality against the shallowness of materialism. 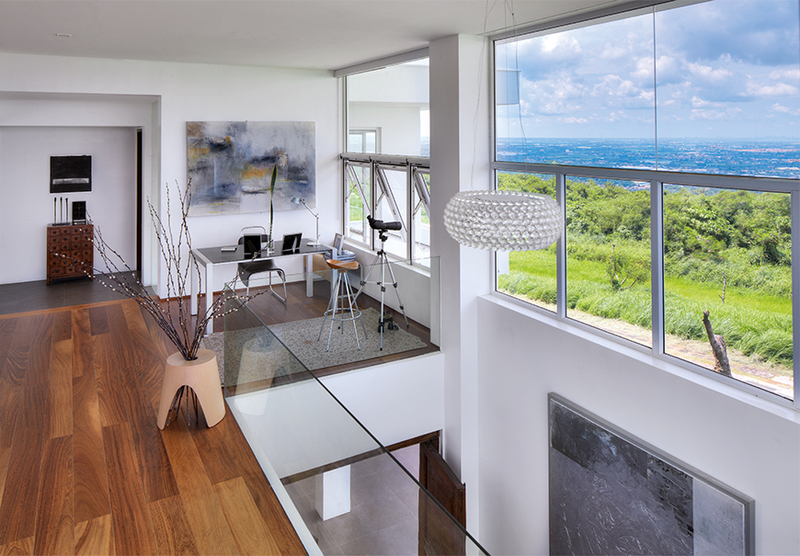 The home office, which occupies a small niche on the landing, enjoys views over Laguna de Bay. This article was published in the January 2016 issue of Inspire Living Magazine. Download it here!